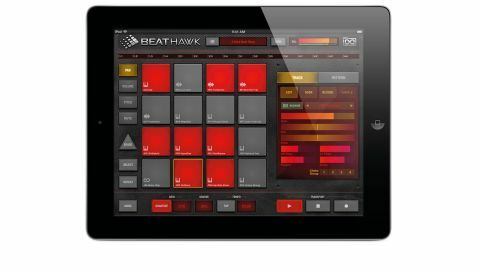 BeatHawk is an enjoyable, efficient and productive musical scratchpad that's certainly worth four quid. Incredibly good value. Simple to use. Factory soundbanks are expandable. UVI's new iOS app is an iPad music production studio modelled on the Akai MPC approach to beat construction, designed to deliver quick results with minimal fuss - so, it's pretty basic. "Two fairly impressive factory soundbanks are included, and can be bolstered through UVI's Expansion Libraries"
You get 16 pads/tracks, and each can hold a one-shot sample, sliced loop, drum kit or pitched sound, with a keyboard view facilitating melodic and slice playback. Two fairly impressive factory soundbanks - Urban and EDM - are included, and these can be bolstered through investment in UVI's Expansion Libraries, available via IAP for between £1.49 and £7.99. You can also import your own sounds and record directly onto pads. Patterns are recorded by tapping the pads and keyboard, or via MIDI input, with real-time performance controls comprising Volume (the equivalent to the MPC's 16 Level mode, mapping the currently selected sound at 16 velocity levels across all pads) Repeat (hold down a pad for constant repeats at the current Quantize note value), Mute (mute pads by tapping them) and Erase. The editable parameters available to each pad, meanwhile, include volume, pan, pitch and amp envelope, plus HP and LP filters, reverb and delay (with controls hidden away in the Preferences screen, annoyingly), timestretching, one- shot mode and four choke groups. Patterns are laid out in Song mode by dragging them onto a timeline, with the Track Mute interface enabling individual sounds to be muted within each instance of a pattern. Export options comprise multitrack MIDI and 44.1kHz/24-bit WAV bouncing of the full stereo mix or all individual tracks. Between them, these make BeatHawk a viable proposition for throwing compositional ideas around on the go, then transferring them to your main DAW for further development. Inter-App Audio, AudioBus, WIST and AudioCopy/Paste are all supported, too, we're pleased to report. Like we said, BeatHawk is a relatively simple mobile production tool that, at just four quid, can't really be sniffed at. Most notable by their absence are any form of graphical pattern editing, more in the way of effects and automation beyond one preset parameter per sound (unnamed but usually a resonant filter); but nonetheless, BeatHawk is an enjoyable, efficient and productive musical scratchpad that's certainly worth four quid.